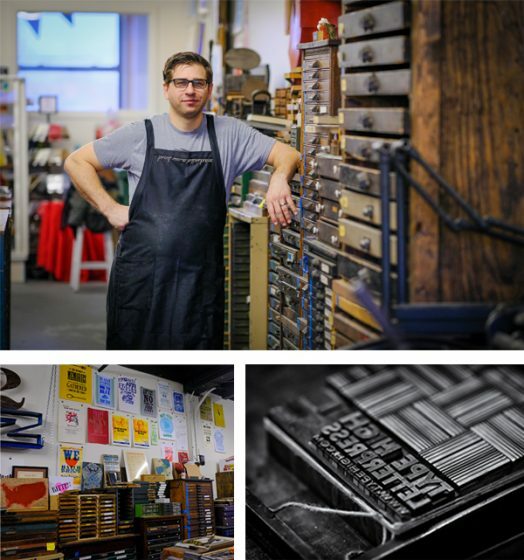 Timothy Fay of Route 3 Press prints in the heart of the Midwest. He left for a brief time to pursue an education in Montana, but he is firmly settled back in the Hawkeye State, sheltered on his centuries old Iowan family farm. He’s passionate about printing and sharing it with others. We welcomed the chance to “visit” his creative space. THE PRESSES: I have a Challenge proof press, a 10 X 15 Old Style Chandler and Price platen, a V-45 Miehle Vertical and a 21 X 28 Miller 2-color flatbed. I also use a photopolymer plate maker and a Model 8 linotype. 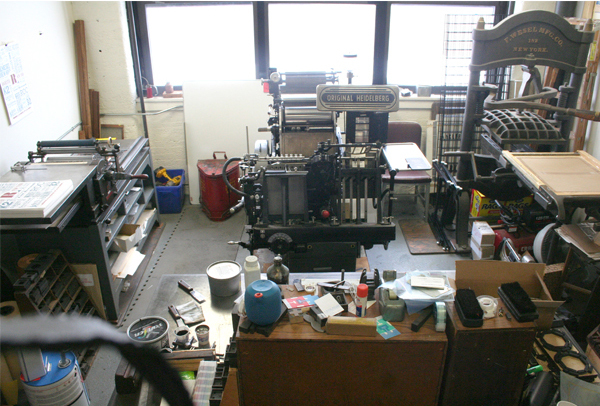 SIZE OF PRINT SHOP: 24 feet wide by 36 feet – 864 square feet. THE LOCATION: My shop is attached to the back of the house I built on our family farm in 1984 — it’s been in our family 150 years now, since the Civil War. My town of Anamosa lies 45 miles west from the Mississippi River. The shop, like the house, is half underground, which makes it easier to heat. I enjoy the improved lighting and ventilation here, as opposed to the old store building I formerly inhabited. My attached house features a cathedral ceiling, and the floor is made of local limestone. Much native and local oak is incorporated into the design. I like living where I work; commutes are for somebody else. 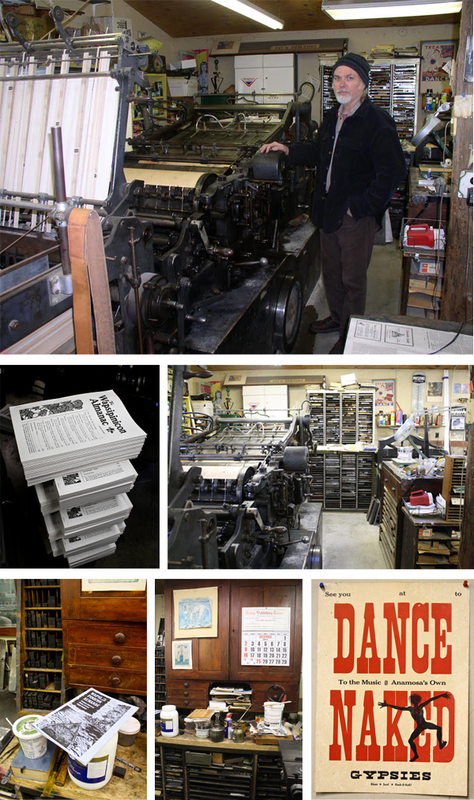 TYPE OF SHOP: I am a commercial shop, and I print some job and book work in addition to my annual Wapsipinicon Almanac. This annual publication is a 160-page collection of essays, fiction, reviews and various tidbits focusing on Iowa. The 2015 Almanac is the 21st issue. FAVORITE THING ABOUT THE SHOP: It’s nice to work in a space I designed and built. I have a nice sound system in place, and since I’m the boss — no Muzak here…. I’ve been collecting letterpress odds and ends since the 1970’s, so I have a few fun items tucked away here. MOST VALUABLE SHOP TOOL: I would say probably the big Miller. It’s a very rare press (the only other operating one in America of which I’m aware is at Arion Press). FAVORITE INK: For most of my work, I use INX black super dense with no drier. CLEAN-UP ROUTINE: I use gasoline for type and plates and press wash for rollers. PROJECT WORKFLOW I set slugs on the linotype. My polymer plates are mounted on either blank linotype slugs or custom bases I had a local machinist make for me. I used to use magnesium plates mounted on wood. Those were expensive and took up too much space. Then I went to metal backed polymer mounted on homemade magnetic bases. Now I use plastic backed polymer and would never go back to metal. I try to avoid having any pied type around. Lino slugs are re-melted into new bigs. OIL OF CHOICE: For lubrication, I use Thirty weight non-detergent or heavier oil for certain spots on the C & P. I like cotton rags. ORGANIZATION ADVICE: I try to organize and “straighten up” before beginning each day. I harbor a good deal of big equipment in a relatively small area, so I need to keep on top of clutter. PRINTING ADVICE: I would stress the importance (especially when running automatic presses) of regulating humidity levels. I don’t have air conditioning, but I constantly run humidifiers in winter and dehumidifiers in summer. 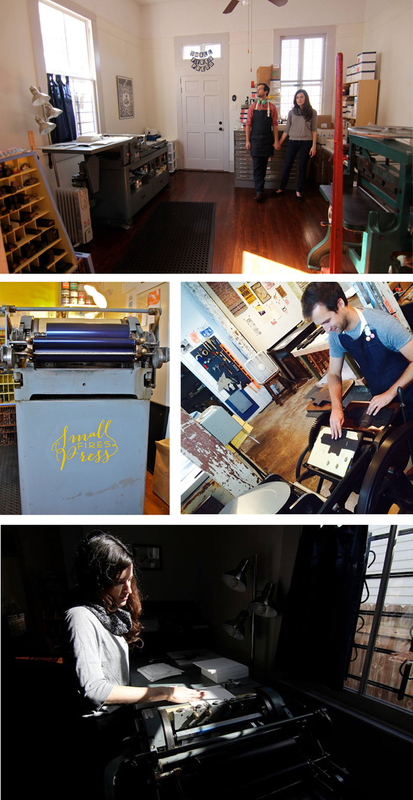 If you are looking for a printer to work elbow to elbow with and soak up some letterpress magic, consider John Fitzgerald of Fitzgerald Press in New Orleans. 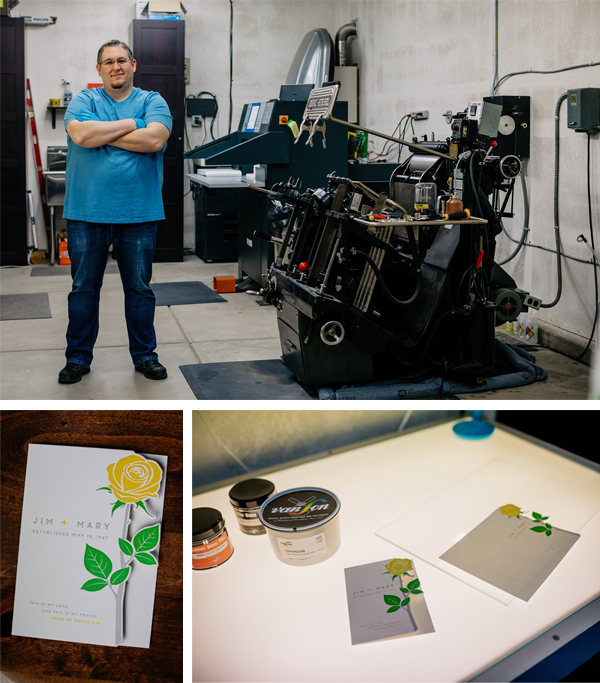 John works solo in his shop down in the Deep South, but he recently opened his doors for us to see his creative and functional printing workspace. COMING BACK TO THE BEGINNING. Let me introduce myself by saying that I feel like I occupy a place in the ever changing print scene. When I was in Junior High School I took Print Shop. I was drawn to printing even earlier after seeing my older sister’s art class lino cuts. 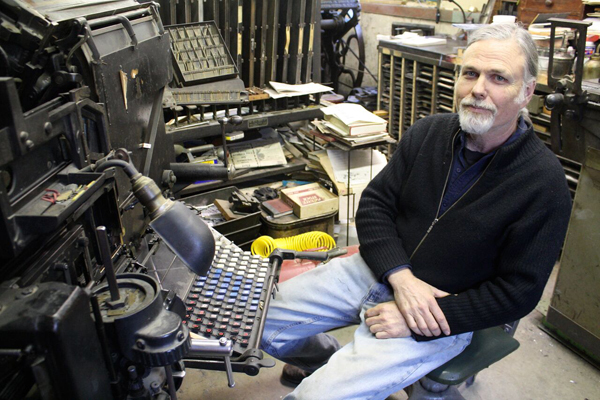 This was the 1960’s and the last of letterpress was still hanging on in the commercial print world. In Jr. High they still started us on letterpress, even though the advanced students were doing offset lithography. By the time I got to trade school it was all offset as was my career in commercial printing, until the digital takeover. By the late ’80’s jobs were getting harder to find and I never really liked offset printing anyhow. I’d always done little lino cuts and special letterpress jobs on equipment that I scrounged from old letterpress shops and could fit in the garage. 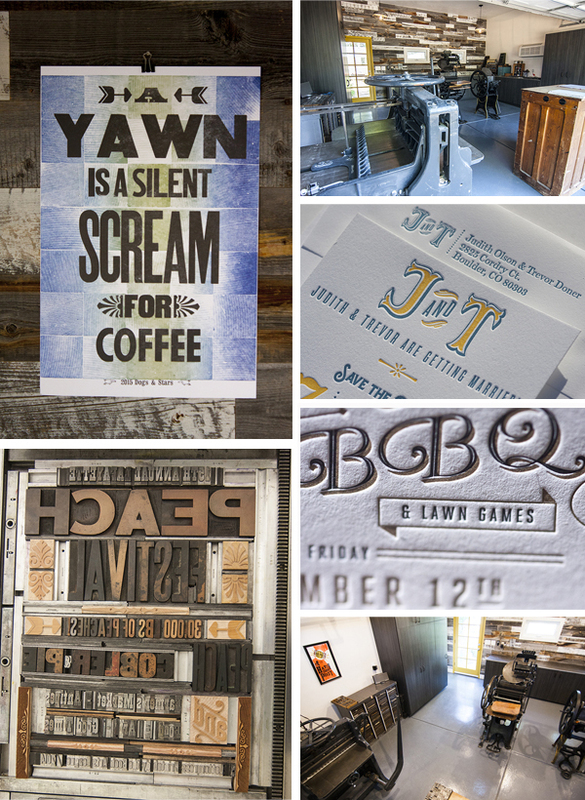 So I turned to letterpress printing as a full time job as the ‘90s began. 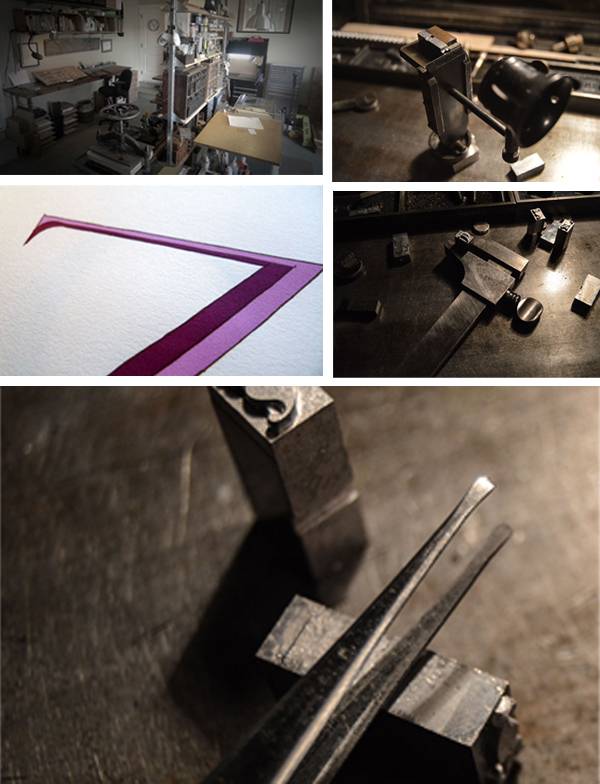 All this to say that I saw commercial letterpress die and be re-born as high craft. I never went to art school and my orientation is towards production. 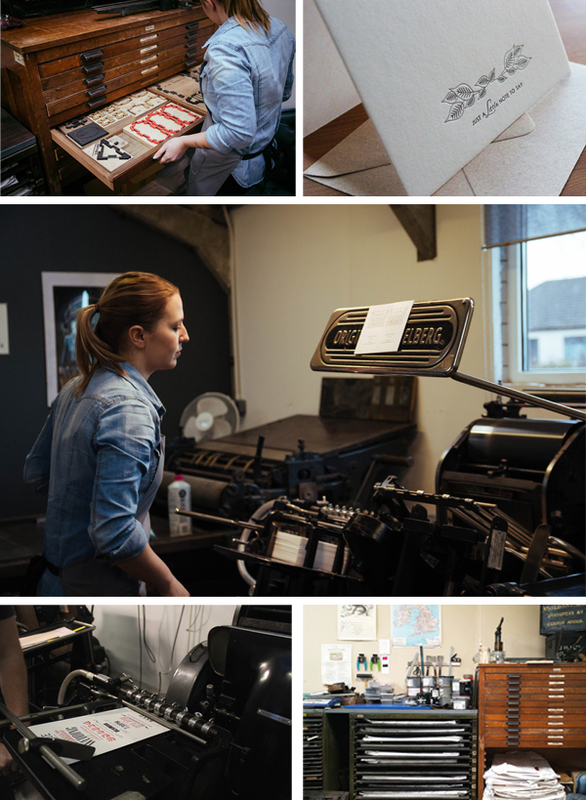 Still I treasure the artistic side of the trade and find myself right at home in this revived letterpress world. PRINTING CHIC DECOR By far my favorite thing in my workspace is my old cherry wood handled copper riveted ink knife that I’ve had for 30 years. My space has two big windows that let in natural light. I also have an overhead fluorescent fixture and use these with a combination of clip lamps and floor lamps. I think of my shop as a working shop, and decoration is definitely an afterthought. I have prints and posters from friends and colleagues on the walls but that’s about it. Equipment and workspaces line the walls, and I have an island in the middle, that includes the proof press, pilot press and galley. 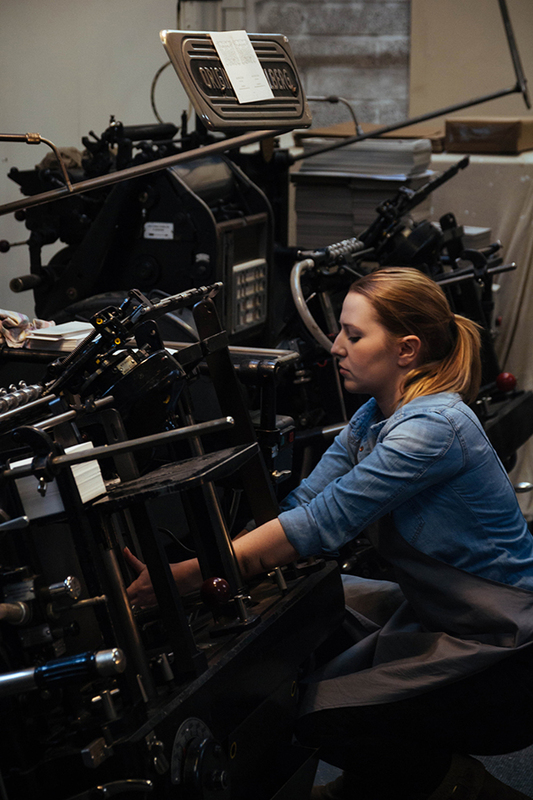 MEET THE FAMILY I have five presses – a C & P Craftsman, an original Heidelberg 10″ x 15″ (Windmill), a C & P Pilot 8″ x 10″, a Printasign Duplicator Model 40 Sign Press (that I use as a proof press) and a Kelsey 3 x 5″ (that I use to bring to shows for demonstrations). HEAVY METAL HOME I rent space in a one story cinderblock building, on Saint Bernard Ave, in the Seventh Ward of New Orleans, between the Treme and Saint Roch neighborhoods. My space is a 18′ x 25′ rectangle, and the rest of the building is occupied by the owner (Red Metal) who is a blacksmith artist. DRESSING THE PRESS My most valuable tool is my C and P Craftsman 12″ x 18″ press. I have two Boxcar bases, one thats 7.5″ x 4.5″ and one thats 12″ x 9″. I use a jet 94 FL plate and I’ve been using this set up for about 8 years now. GOLD IS THE NEW BLACK I use regular commercial offset inks (Zip Set). I mix custom colors using the Pantone system. My current favorite color is an improvised mix of dense black and 875 gold. This makes a super dense, warm and delicious black. PROTECTING THE EQUIPMENT For clean-up, I scrape as much ink off the disk as I can, then run the press with a little kerosene to loosen things up. I do my major cleanup with kerosene and then finish the rollers with a roller wash (Varn V-120). I don’t like to use mineral spirits because it’s too strong. Kerosene leaves an oily residue that doesn’t seem to hurt ink colors and helps protect metal in this humid climate. A PLACE FOR EVERYTHING THAT IS TYPE I have no pied type! 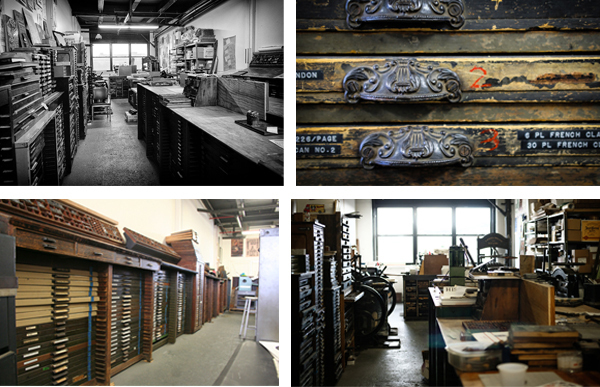 Over the years I’ve rescued a lot of type – much of it is now stored in gallery trays, but I keep it all sorted. Pied type is an offense! SYSTEM THAT WORKS FOR ME In terms of organization, the main problem I have is that I’m a solo operator and I fly by the seat of my pants. Every active job has a file folder in a rack on the wall, so I don’t lose track of things, but that’s about as far it goes for organization. PROPERLY ATTIRED When I come into the shop, the very first thing I do is put on my apron. It’s like being in costume – I know I’m here to work. YOU HEARD IT FROM ME “Be attentive to ink roller height” is the best advise I have – getting the ink to contact the form just right is the key to good letterpress printing. I’d been printing for years before I really understood that. Huge round of thanks to John for letting us take a tour of his wonderful shop! New Orleans is the home of soulful jazz, the po’ boy sandwich, and a famous pirate or two. 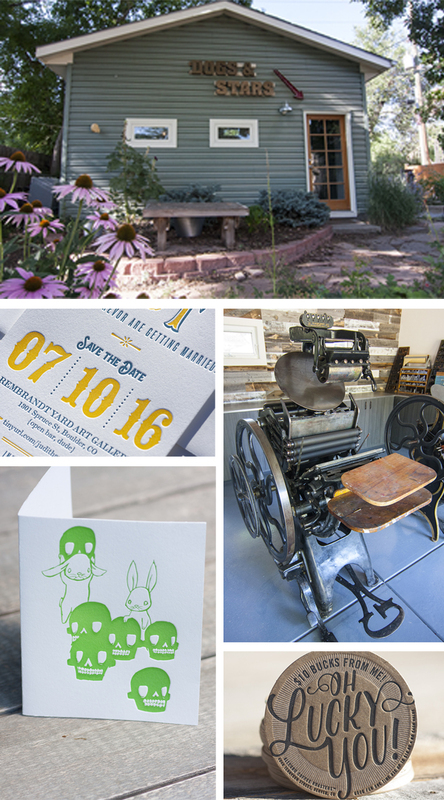 And sure, it is frequently steamy-hot, but that is the chosen locale of the letterpress print shop Small Fires Press. 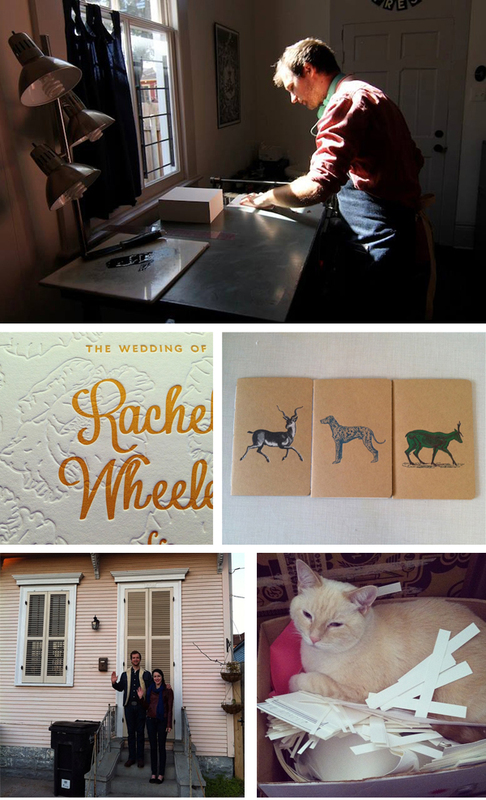 Husband and wife team Friedrich Kerksieck and Gabrielle Trimm took to New Orleans like true natives and have set off some major sparks in the growing letterpress community of The Big Easy. 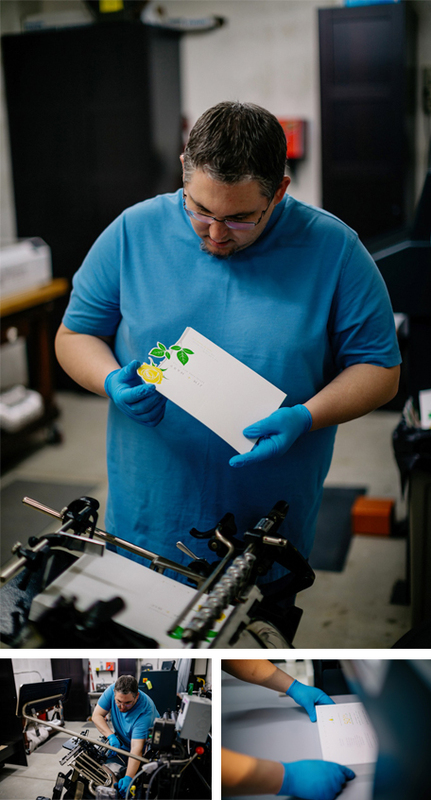 Step into their workspace and you may smell something unexpected blending with the usual print shop aromas…is that pie? 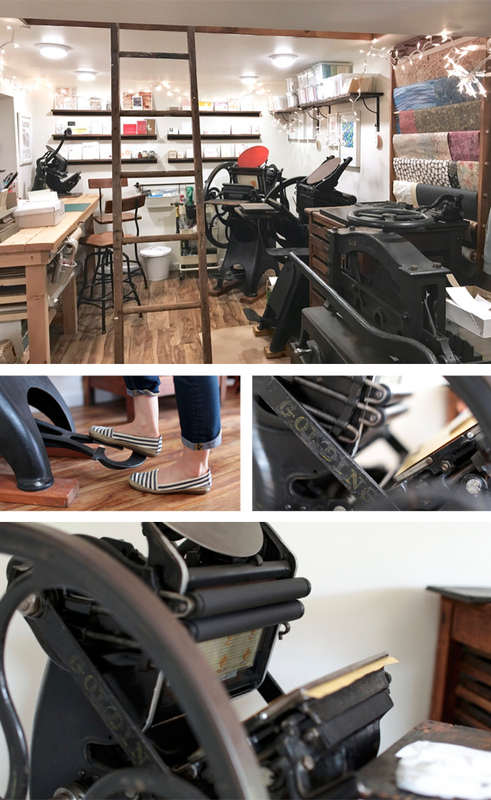 To celebrate their one year anniversary of printing and bookbinding, Friedrich and Gabrielle gave us a peek inside their studio – take a look. Streetside Studio Our building is a pink double shotgun in the Saint Roch neighborhood in New Orleans. 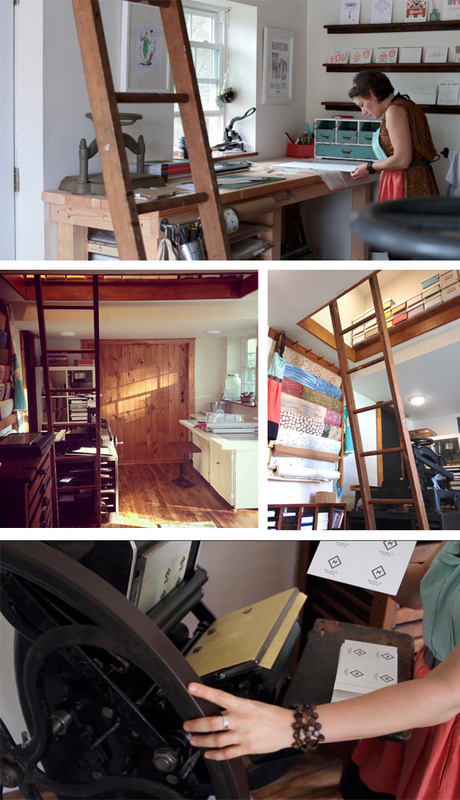 The studio is set up in the first room and we live in the other three rooms of the house. The studio is 14×13’. Better Than Gumbo Our most valuable tool has gotta be our Vandercook #4, of course. Dressing the Press We’ve been using a 13” X 19” standard Boxcar base I got when I purchased the press five years ago. I generally stick to the KF95 plate. Fluorescent Favorites I bought a set of blue, magenta & yellow neons not too long ago. I don’t usually get much call for them in the job work I do for clients, but whenever I’m doing a creative project I usually go right to those cans. Green For Clean I put a little bit of vegetable shortening to loosen the ink up & use some shop rags to wipe everything down with. Then I go over everything again with some simple green or mineral spirits depending on what color is going on the press next. Loose Bits I don’t have any pied type any more – the small bit that was left got abandoned when we moved from Memphis last year, but I’ve still got a few drawers of type that need to get reorganized. Less Is Better I’ve found that I work better with a little less tabletop space. I tend to fill up what ever is available and am bad about putting projects away unless I have to. In Memphis I had a folding table set up in the middle of the space to work off of and the top of my flat files collected odds and ends. Now I’ve ditched the table 95% of the time & just work off the flat file. Now there’s a lot less to knock over or walk around. Studio Cats Working from home is convenient and comfortable. It’s nice to be able to do some slow cooking or pie baking in the kitchen while there’s ink on the press. We can trade off on household tasks and printing tasks when needed and everything is all in one place. Our two cats keep good company. Bip has a bed right at the end of the press & he sleeps there while I’m printing away. Collaborate For Inspiration I think that the very best practice is to print every day. Nothing will keep you fresher. 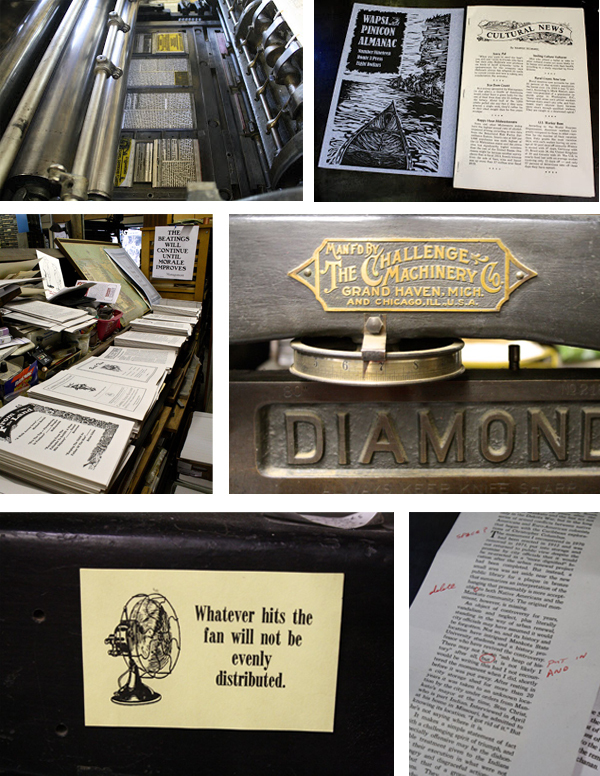 That, and always be curious – especially with visiting other presses and print spaces. I love that in New Orleans there are so many new and established printers. My favorite thing to do is to go print a project with someone else and see how they work – what they do for makeready & the rest of the process. Everyone does things a little differently and you can always pick up a good tip or two. Our thanks to Gabrielle and Friedrich at Small Fires Press for the southern hospitality; continue to let the good times roll!